We are under way in Nantucket Sound, westbound for Woods Hole (the hole, not the town). We weighed anchor this morning after a lovely three night stay in Nantucket Harbor, where a busy Saturday afternoon arrival had us dropping the hook on the very edge of the harbor with the big girls (map). 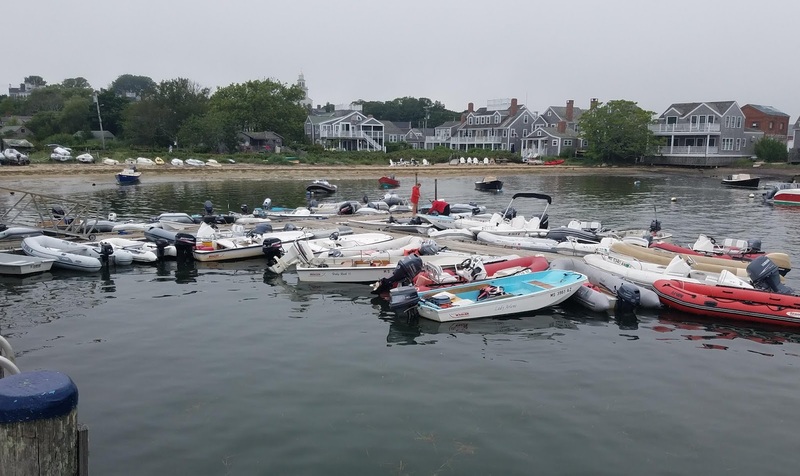 One of the overbooked dinghy docks in Nantucket Harbor. We had to squeeze in here daily. 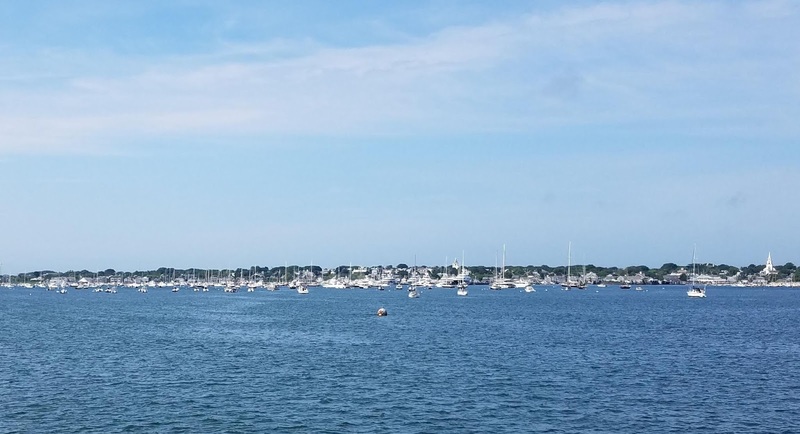 We had a pleasant seven hour cruise from Menemsha on Saturday. 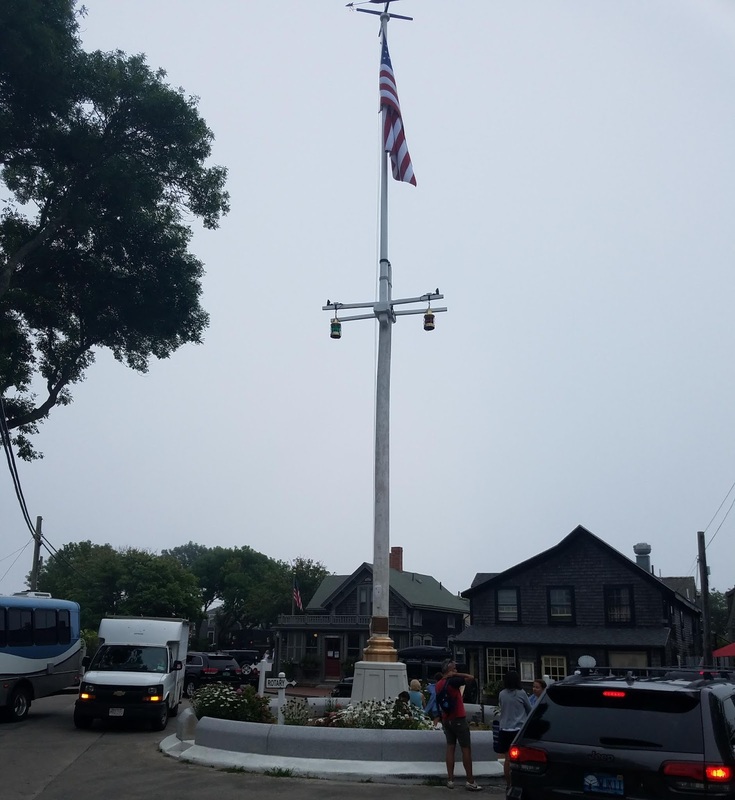 Even in overcast and rain, the pleasure boat traffic was a bit chaotic both as we passed Vineyard Haven on Marthas Vineyard, and as we made our entrance to Nantucket. We were a bit apprehensive about finding a spot in Nantucket in the middle of a summer weekend. As we steamed into the harbor, Louise noticed our ensign was missing. Neither of us could remember stowing it, and it was not in the place we use for that. We ended up going back through our on-board camera video after we anchored, and found it had wobbled out of its mount and lept off the boat at 11:29 in the morning, somewhere off Marthas Vineyard. The ensign itself was due for retirement, so we can now say its burial was at sea. Sadly, we'll need a new ensign staff now. Our ensign leaves us (about a half minute in). Time is in EST so it's actually an hour later in EDT. Just as we imagined, the harbor was packed. We were hoping to come around behind the designated mooring field and drop just south of it, but it turns out the moorings now extend across the harbor in all directions. After dancing around the traffic headed to and from the moorings and the docks, we headed back to the north end and turned east toward First Point. We got pretty much the last decent spot that would fit us, with several boats even further east. As we were dropping the anchor, the harbormaster's boat passed us; he stopped at each of the vessels anchored to our east, and shortly thereafter each weighed anchor and headed elsewhere. I'm not sure where the magic imaginary "no anchoring" line is, but I am very glad we ended up inside of it. A less-busy harbor this morning. The empty space between us and the other boats is a shoal, barely 3' at low. 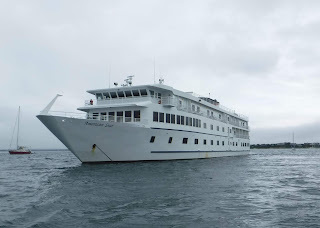 Not long afterward, as we were getting ready to head ashore for dinner, a 92' Feadship dropped anchor right next to us, in a way that put our swing circles overlapping uncomfortably. I called them on the radio but got the owner, who said the captain was ashore and would get back to me. We put them on notice and left for dinner. They would later re-anchor two more times before finally settling on a spot just barely far enough away from us. When I called to make reservations at Slip 14, the closest casual restaurant to the town dinghy dock, I learned that the Boston Pops were in town for their annual concert at Jetty Park. 20 minutes to curtain we were able to walk right in and get a table at the bar. I think they played despite the rain -- the stage was under a tent -- but having been to outdoor Pops concerts in my youth, I could not imagine it was pleasant or comfortable for the audience. The concert closed with fireworks that we could hear on deck but barely see because the rain/mist/fog was so thick, even though we were just a mile away. The weather improved Sunday and we had a nice afternoon and evening exploring the old town and going to dinner at Brotherhood of Thieves. We opted to wait until late in the day to let the throngs of tourists clear out, and by late afternoon things were fairly pleasant in the village. I spent the earlier part of the day working on routes, schedules, and dealing with trying to replace the tender and the house batteries. American Star at anchor. Vector is obscured behind her. Yesterday morning we enjoyed watching the enormous American Star cruise ship come into the harbor and drop their hook just a couple hundred yards behind us. We've crossed paths with them and their sister ships many times on the ICW, even sharing a dock in Savannah and Charleston. There would not have been room for them Saturday when we arrived, but on a Monday they found a spot. It puts our anchoring tribulations in perspective. 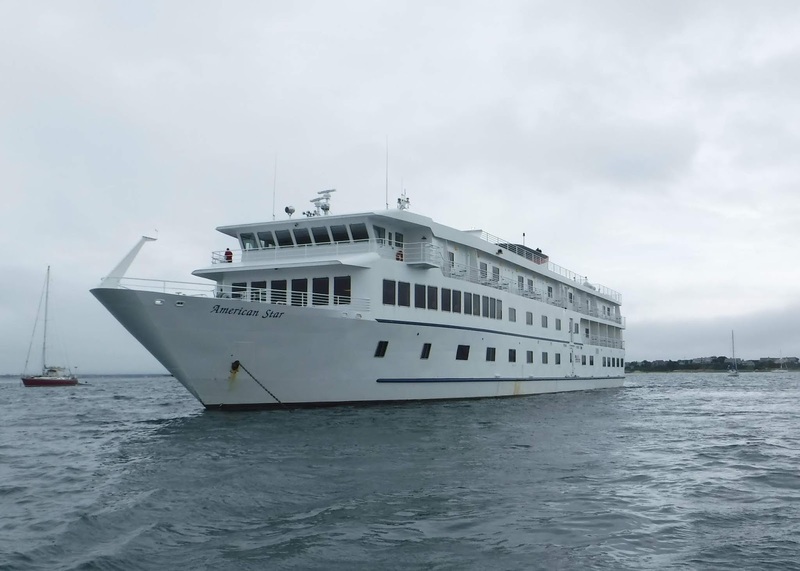 They lowered their enormous tender and shuttled their guests ashore. 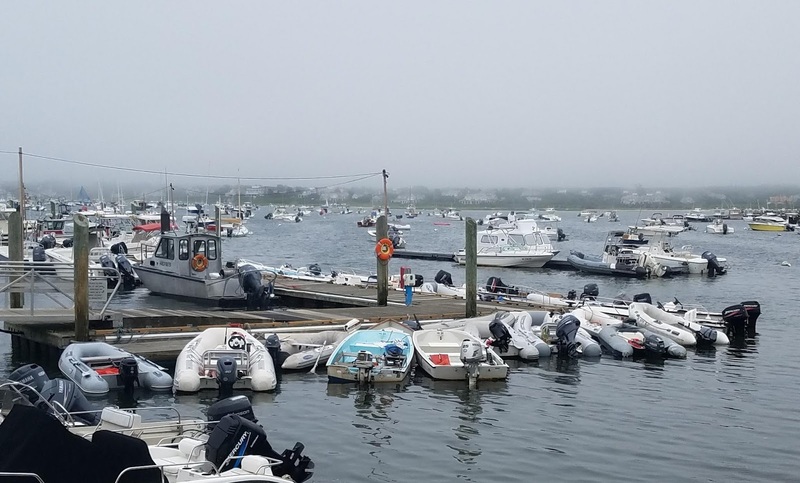 Words can not adequately describe just how full this harbor is in the height of the season, and the picture I was able to take from the flybridge, above, is not much better. I can't even imagine what it must be like here on a holiday; we barely found a spot on a normal Saturday. 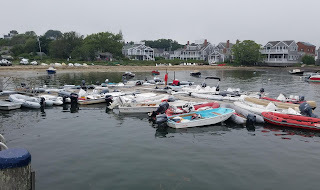 The dinghy docks, of which there are two, are always so full that it is necessary to nose up and "part the sea" of dinghies to try to get close enough to the dock to disembark. The other dinghy dock; Scalar is lost behind the workboat in this photo. We spent the day ashore, riding around the island on the local transit system. An unlimited day pass is $8, and that let us ride the line all the way out to Millie's Restaurant in Madaket (we did not go in), then the loop around the south part of town, and finally take the line out to Siasconset (locally called just Sconset), where we strolled around town and had a snack before returning via Polpis. By the time we got off the bus we felt we had pretty much seen the entire island. We had a final meal ashore last night at The Boarding House, popping into the Stop & Shop for a few groceries before returning to the tender. We made our way back across the harbor in thick fog and total darkness, making us glad we left extra outside lights on when we left Vector. Many boats in the mooring field were completely unlit, and even some under way tenders were dark. Both are illegal and dangerous; we had to keep a sharp lookout to avoid smacking into any of them. Sconset (Siasconset). The town center is this traffic circle with a post office and four businesses. It's pretty dark in the harbor and I had hoped to catch the peak of the Perseids last night, but of course it was still completely overcast when I went out on deck at 2am. Oh well. It's less cloudy today, and maybe I will catch some tonight out near Woods Hole. This morning we decked the tender and got under way just after slack. We've been putting along at 1400 rpm against a wicked current; the late departure and slow speed are to let the tide catch up with us and reverse before the end of our trip. It's finally letting up now and should be in our favor in the next hour. 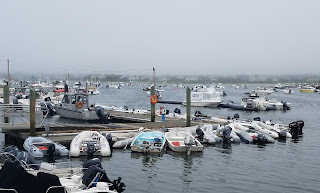 The relatively short day to Woods Hole is also on account of tidal current; once we make the turn into Buzzards Bay it will again be against us for the rest of the day. So we will stop instead and get an early start tomorrow for a favorable current up the bay and through the Cap Cod Canal. Tomorrow evening we should be in Provincetown. 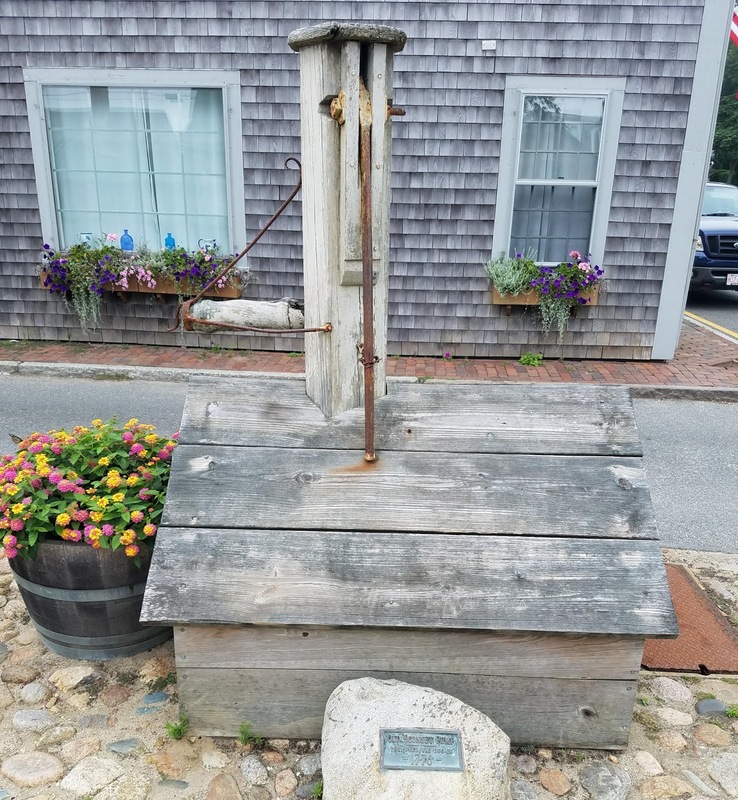 The "Sconset Pump" over a well from 1776. Lots of 200-year-old houses here, too. 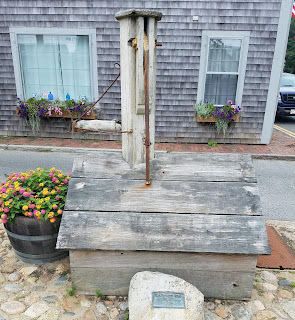 We're skipping Marthas Vineyard, Woods Hole (the town), Onset, and other intermediate stops because we are now on a schedule, and we've been to each of those on our last pass through here. The schedule involves getting to New Hampshire to visit with my cousins next Thursday and Friday, which are the last open days on their calendar. At this writing it is unclear just where in NH (or maybe MA) we will stay for this visit; anchorages with dinghy landings are few and docks are outrageous here. From where we started today to coastal New Hampshire is five days of travel, and we want to be in port by Wednesday afternoon. That gives us four days of leeway, and we'll use a couple of those to visit Provincetown, another stop we had to skip last time through. 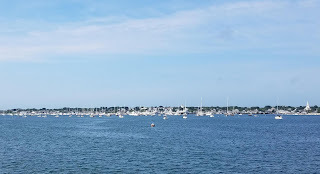 We visisted P-Town when we were still in the bus, but the closest place to park was a state park mid-cape, and we just made a whirlwind tour of P-Town on a very long scooter ride. We're looking forward to being a bit closer and having a more relaxed visit.